In our blog article this week, we are going to talk about some of the secrets that we have found for obtaining a beautiful smile and taking care of it. Our patients are always asking us how they can achieve a perfect smile. We have helped many of our patients achieve the smile of their dreams with various cosmetic dental procedures. If you oral hygiene is neglected, however, even after extensive dental treatment, your smile may deteriorate over time. It is extremely important that your smile is properly maintained, even if you have never had any extensive dental treatment. According to the American Academy of Cosmetic Dentistry, almost 100% of American adults believe that a good smile is one of the most important social assets. We agree with this statement and are here today to teach you some of the best ways to take care of your teeth. The following list contains some of the most important dental treatments to improve your smile. It will also provide you with some simple steps that you should consider adding to your regimen to improve and maintain the appearance of your smile. Here at Matthew Nawrocki General Dentistry and Prosthodontics, we want our patients to be educated about all things dentistry. One way that we teach our patients regularly is with our weekly blogs. We hope that you learn something new today and that you consider incorporating some of these things into your oral health regimen. If you are already doing most of these things then you already know what it takes to have a great smile! Keep it up! We are always accepting new patients from in and around the Orange Park area. Please feel free to contact us at any time electronically to schedule a consultation or call (904)602-8396. This is one of those things that many people say that they do regularly, but may not do as often as they think. 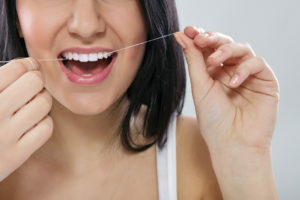 Flossing is extremely important for maintaining a great smile and people with beautiful teeth floss daily, no matter what. Flossing is important because it prevents cavities from forming between the teeth and it maintains healthy gums. Your teeth need healthy gums in order to stay healthy and beautiful. If you are unsure of the proper way to floss or the best floss to use, ask your dentist or dental hygienist for a demonstration and recommendation. Regular brushing is extremely important for maintaining a great smile. Regular brushing removes plaque, prevents cavities, prevents gum diseases, and removes minor stains that are created from food and beverages. Many people do not know the proper way to brush and most people do not brush their teeth for the recommended amount of time. Proper brushing technique is in small circular movements at a 45 degree angle to your gums. Electric toothbrushes are designed to encourage this brushing motion so that some of the guesswork is taken out of the brushing process. You should also be brushing your teeth for two minutes at least twice per day. Two minutes is a pretty long time. An electric toothbrush is helpful because most of them have built-in timers to encourage you to brush for the correct amount of time. Even if you have perfect oral hygiene, brushing twice per day and flossing at least once per day, you should still visit your dental office at least every 6 months. Your dental hygienist can remove stains and tartar that have accumulated that are impossible to remove at home. Additionally, your dentist will check regularly for signs of oral cancer, cavities, and periodontitis and provide any preventative strategies or treatments that are recommended. Most people do not naturally develop straight teeth. For the majority of patients, orthodontic treatment is necessary to obtain straight teeth that are properly aligned. Crooked teeth can also be beautiful and it is ultimately your decision whether or not to have orthodontic treatment. It is never too late to get adult braces, and Invisalign is an excellent alternative that avoids the unsightly appearance of traditional braces. If you have ever had orthodontic treatment, you should wear your retainer nightly for the rest of your life to maintain ideal results. If you lose your retainer, you should have a new one made as soon as possible. When your teeth are moved with orthodontic treatment, they still have the tendency to move back to where they were before. Retainers help to maintain the teeth in their new positions. It is important to follow the recommendations that your dentist or orthodontist gives you for retainer use. In order to have the whitest, brightest teeth, you should whiten your teeth regularly. It is extremely important, however, that you do not whiten your teeth too often. Be sure to consult your dental provider before undergoing any whitening treatment, even if it is over the counter whitening trays or toothpastes designed to be used at home. If you use an over the counter whitening toothpaste, you should alternate it with sensitive toothpaste that contains potassium nitrate in order to maintain the strength of your enamel. Whitening treatments, even those completed in the dental office, do not last forever so it is important to maintain results with periodic whitening treatments. For more information on Dr. Matthew Nawrocki and his cosmetic dental training, please watch the following video from the American College of Prosthodontists. We hope that you enjoyed reading our blog today and that you learned some tips for obtaining and maintaining a great smile. If you have any lingering questions or would like to schedule a consultation, please feel free to contact us at any time electronically or call (904)602-8396.